Dr. Bastian combines keen observational powers and a skeptical eye to explore the boundaries of science and speculation. Using the imaginative playground of the stage, the author fosters an emotional connection, through parody, humor, and irony, to promote an understanding of science and skepticism. These plays will make you laugh, make you cry, and, most importantly, make you think. Buy my new Kindle book! Available at Amazon.com. What really happened to the dinosaurs and unicorns? Can the beginning of humanity be traced to the creative impulses of a couple of ducks? What is it like to die of Lou Gehrig’s Disease? Are we being invaded by extraterrestrials disguised as McDonald’s employees? Is there a secret communication between twins before they are born? Do animals have souls? 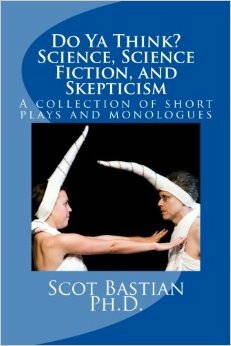 These, and many other questions, are explored in this anthology of 15 short plays and monologues.